Step 1 / Begin by parting the hair where you normally prefer; I’m placing mine on the far right side. Step 2 / Divide off a section of hair at the crown, lay the left side over the right and pin it against the head with several bobby pins. Step 3 / Now divide the remaining hair into three sections, a left side, right side and a back section. 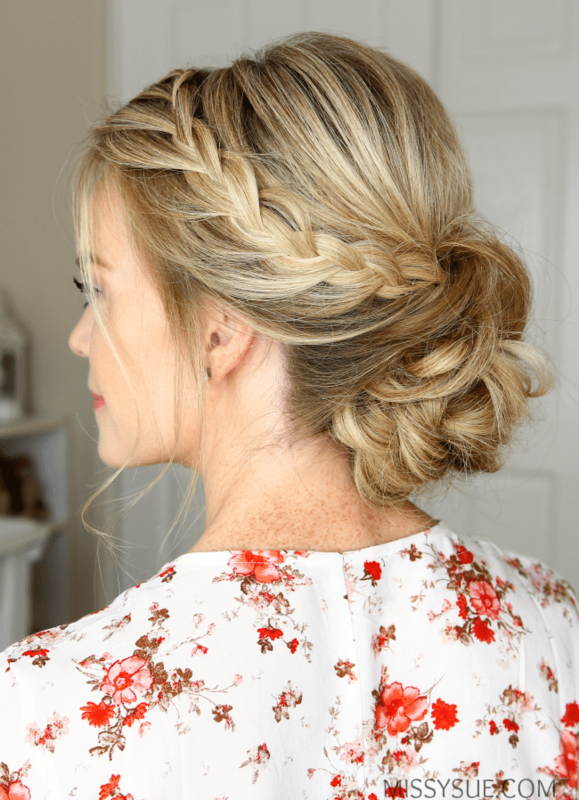 Step 4 / Tie the back section into a low ponytail with a clear elastic band and braid it into three strand braid, securing the end with another elastic. Step 5 / Pull on the edges of the braid to make it fuller and then wrap it into a bun around the top elastic. Step 6 / Slide bobby pins arounds the edges to secure it against the head. Step 7 / Now braid the left section of hair into a lace braid bringing in hair along the hairline and working back towards the bun. Step 8 / When the last section of hair is brought in, cross the braid over the top of the bun and pin it against the head with a few bobby pins. Step 9 / Go back and fan out the braid by pulling slightly on the edges to make it fuller. Step 10 / Now create a second lace braid with the section on the right side; crossing the side strands over the middle and bringing in hair along the hair line until reaching the bun at the back. Step 11 / Lay the braid over the top of the bun and slide several bobby pins into the braid to pin it against the head. Step 12 / Take the ends from the braids and create small loops at the top of the bun and pin them in place with bobby pins. Enjoy yourstyles, but just how long does hair need to be? Where do you shop girl? Hi! Ok I LOVE doing hair but my hair is way too thin for anything fun! Do you have any advice or anything to help me get it thicker? I would definitely recommend trying extensions (: My hair is thinner after having extensions and they really make a big difference! Oh my gosh! I love this hairstyle. I actually feel like it’s doable for a special occasion. Thanks for explaining the concept of the lace braid. As always, I love the coloring of your hair. Such movement! Keep up the great work! !